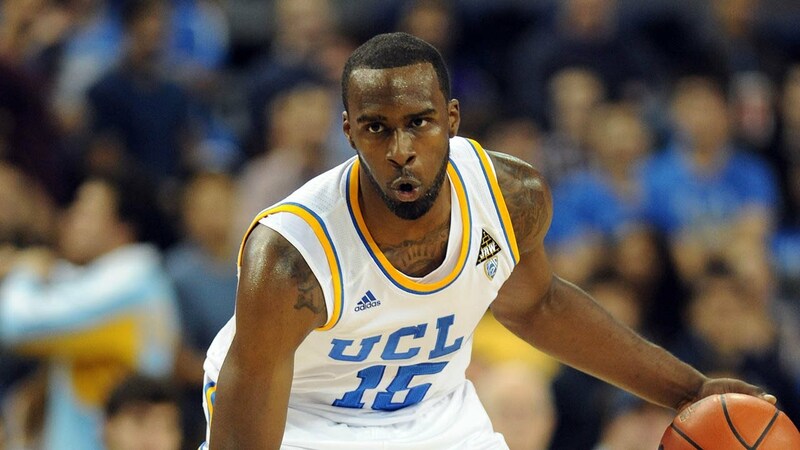 Shabazz Muhammad is shooting 46.3 percent from the field, this year. That statistic is not shocking because it is great or unusual in any way. It is shocking because, for such a long stretch of this season, Shabazz had pitiful efficiency numbers. For the season’s first three months, he shot just 26.1 percent from the field. That’s obviously terrible. I tend to be an apologist for Timberwolves rookies, and have often advanced the notion that he would shoot a higher percentage from the field if he were given more consistent minutes. But I am very unfamiliar with my Timberwolves Rookie Apologist takes being proven correct. In the case of Muhammad (and to some extent, Gorgui Dieng) it seems there may be an exception. He saw his first doses of real playing time in February. In that month, he shot 45.7 percent from the field, while producing 20.5 points and 8.9 rebounds per 36 minutes. In March, in even more time, those numbers changed to 53.1 percent, 18.2 points, and 5.2 rebounds. His assist numbers remain extremely low and true to the projections built off of his collegiate stats. Shabazz’s PER is up to 13.4 and almost at the league average of 15.0. Just about everything is happening on the left block or right at the rim. 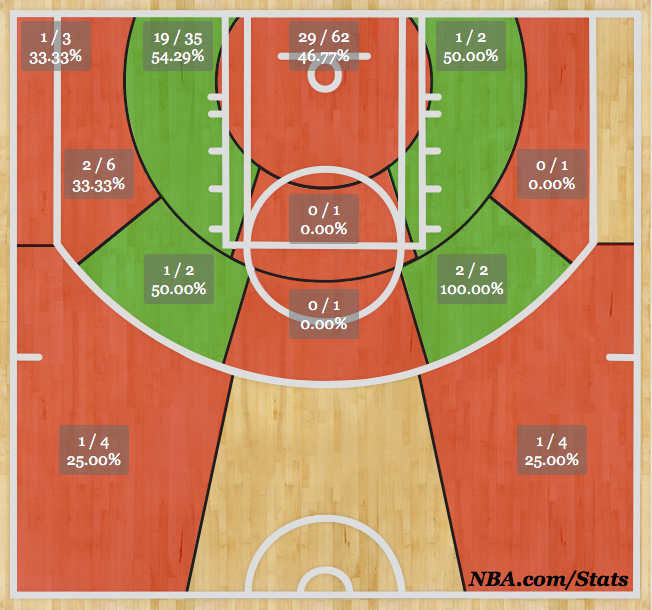 He’s in the green (above league averages) on the left block, constantly going to his lefty hook shot. It is clear when watching his games that his success rate depends largely on whether his defender has scouted this move. When defenders overplay the baseline, he struggles. When they don’t, he scores. He has excellent footwork and timing when setting up the requisite separation for that push shot, and a fine touch in finishing it. Last week, Shabazz’s father Ron Holmes was sentenced to over three years of prison for various federal fraud charges. Obviously, the process leading to the judge’s sentencing spans a long period of time and has been taking place all season. This would inevitably be a distraction for his son; a young man living in a new city, taking on a new, challenging career. Maybe this is more apologizing, but I don’t think so. It is impressive that Shabazz has been able to — by all accounts — keep a very professional attitude throughout what must have been a difficult year in his life. The way I see it, the positive outcomes for Shabazz’s career could look one of two ways: Either as a starting small forward who scores in a variety of ways, or as a bench-scoring sparkplug, who is much more matchup-specific and specialized. The former seems ideal, but less realistic. For Shabazz to become an all-around wing — particularly one who can defend opposing wings — I think he needs to go the route of his fellow Timberwolf and UCLA Bruin alum Kevin Love, and shed some weight. He’s too big in the upper body to be closing out to 24 feet. Without some weight loss, I think Shabazz’s future will look more like his present; spending most of his time with the second unit, on the left block, against lesser defensive opposition. With just 8 games remaining and no shot at the playoffs, I think we all hope to see more Shabazz minutes. Next up is Miami on Friday night. Maybe he’ll get his first crack at LeBron. I agree other than to pessimistically add that even if he does shed some weight there is no clear indication he has the shooting or defense to be a full time wing. He did have a nice little display of dribbling last night that was good to see and he has been nothing short of enjoyable as a team member/ player. I think we are all rooting for him and deserve to see more of him at this point. I just wish there was more reason to think his outside shooting is something that will show up. I am more pessimistic about his defense and playmaking as a passer than the shooting. He shot almost 38 percent from three in college and has a simple-enough stroke to make me think he’ll become at least decent from downtown in the pros. He’s only shot 11 treys this season, and my memory is that a high percentage of those were during his Fourth Quarter Chucking Contests with AJ Price in the season’s early months. I do agree that he needs an outside shot to be a starting-caliber wing, though. His defense and passing will never be strong enough to offset a less-than-complete scoring arsenal (as a starter). Really I think it’s his abilIty to defend that will determine his fate in the NBA. I don’t see Bazz becoming so dynamic offensively that he doesn’t need to defend to get consistent minutes- although he might be able to close the gap some with rebounding. He looks so tiny in that UCLA picture. So, we have another offseason of hoping our undersized four sheds enough pounds to play the three. At least, unlike Derrick, Bazz already has one way he can consistently score in the NBA. Of course, that is easy to take away but Derrick has nothing to take away. Yeah, it looks like his head was photoshop’d onto Kyle Anderson’s body in that pic. Weird. I think Bazz will come back next season showing more scoring moves. I’m not sure that he doesn’t *have* more right now, but his playing time has been so limited that–at least if I were him–I’d immediately try to exploit my best move. Depending on the offense they’re running next year, I think we’ll see a lot more Bazz curls leading to 14-16 footers, and more floaters in the middle of the lane from around the bottom of the jump ball circle. Watching him at UCLA, he was solid on both of those plays.